With direct access to your credit card, home address and Funyuns infatuation, hotels collect more personal data than just about everyone not named Mark Zuckerberg. As such, they possess a tremendous amount of power you would hope they would wield responsibly. But sadly, not only did Motel 6 miss the memo, but they purposely compromised the safety of over 80,000 guests. 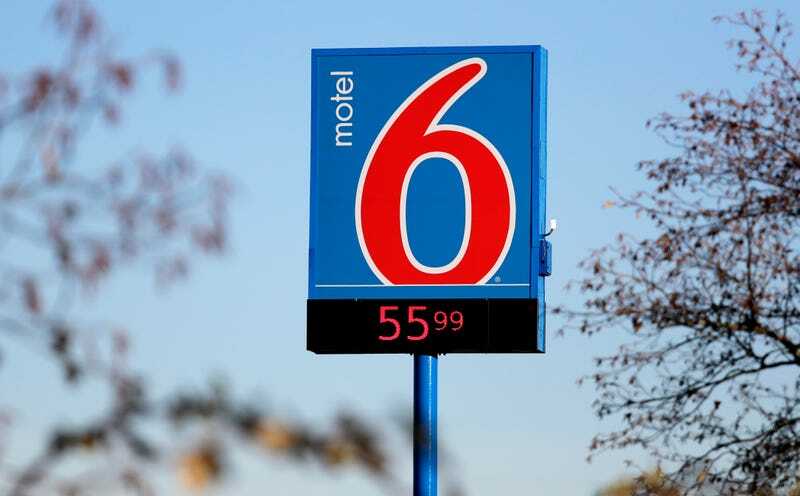 According to the Washington Post, from 2015 to 2017, seven Motel 6 locations in the state of Washington established an informal arrangement with federal immigration officials. The company provided the personal information of its guests, leading to at least nine people being detained. “In anticipation of ICE’s daily visits, some Motel 6 locations routinely printed their guest lists and a form, referred to as a ‘law enforcement acknowledgement form,’ which the ICE agents signed upon receiving the day’s guest list,” [Washington Attorney General Bob] Ferguson’s office said Friday in a news release. “At the two Everett locations, for example, ICE agents routinely visited the motels early in the morning, sometimes twice a day, from February 2015 through September 2017. ICE agents requested the day’s guest list, circled guests with Latino-sounding names and returned to their vehicles.” Doing so is, of course, illegal. But the Washington state attorney general’s office revealed that it was specifically “Latino-sounding” names that were shared with immigration officials. Guests were approached by ICE agents and detained at Motel 6 properties, while the office states that others were detained after their hotel stay. ABC News shared the following story of a guest who spent a single night at a Seattle location just so he could wrap Christmas presents for his four children. According to Washington Attorney General Bob Ferguson, this heinous practice constituted an illegal invasion of privacy, which he responded to by filing a lawsuit against the hotel chain. On Friday, a $12 million settlement with guests who had been affected was reached. Every guest who had their personal information illegally shared with ICE is eligible for restitution, and claimants will not be required to disclose their immigration status. Ferguson responded with his own.